An article by Scott Nappalos about how organizing has taken a new direction in our current society where we have to build movements rather than join, and that a new level of commitment is needed. Organizing has taken a new direction in our current society where we have to build movements rather than join. A new level of commitment is needed. 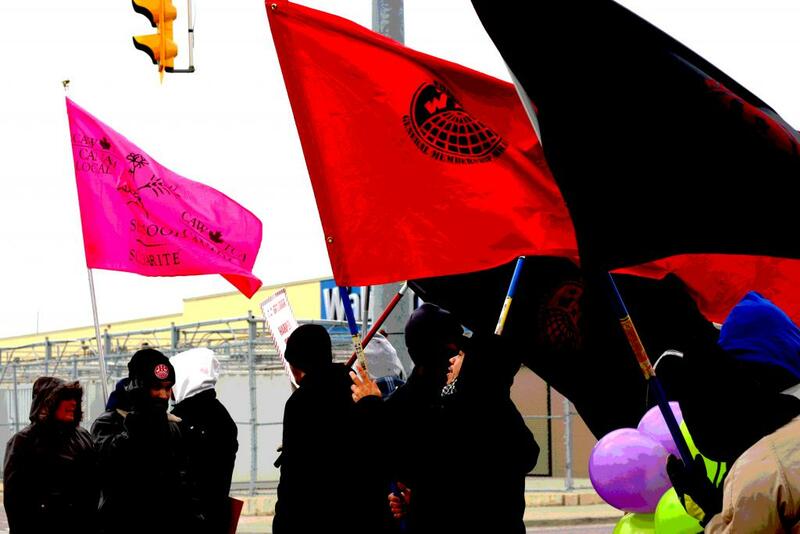 Miami IWW member Scott Nikolas Nappalos provides a great analysis and critique of organizing today in the piece below. When people hit a brick wall organizing today they are very quick to look at big picture aspects to explain their failures. For many of the tiniest fights we see calls for large revisions of structure of social organizations, committees, and demographics in countless versions. Ideology is also popular with a deep drive towards critique and adopting new ideologies as technical fixes for hurdles in organizing; forms of born-again ideology. The worst of this is relying on large-scale analyses of the economic environment to explain away concrete daily problems that seek to persuade people not to fight in vast sections of society and the globe because of often amateurish crystal gazing and doit- yourself political economy. The focus is generally on us, likely because of how demobilized society is, which shifts the view away from the people struggling. There is a basic element of organizing people to fight around their daily interests that rarely is discussed and yet is a fundamental aspect of nearly everything political happening today. A question we should ask ourselves perpetually is: do these people want to organize? As revolutionaries we ask people not only to engage in their immediate problems, but also to take on the system itself; to abolish the wage system and hierarchical exploitation and oppression. Even people’s immediate issues, say low wages, take a significant commitment of time and emotional energy to deal with. People have to be willing to plan, meet, and exert their resources towards something they may already hate (their job, their conditions). There are lots of detours that allow people to avoid this stuff. We move jobs, we change buildings, move to different cities and neighborhoods; try to avoid the police, take matters into our own hands, etc. The forces against sustained action are powerful, especially today when there is no liberatory social force that intervenes consistently within society. People are working in isolation with bad odds when there are more pleasant things they could probably be doing. Simply put, it’s often better for people not to fight than to fight in the immediate. Organizing involves sinking more of one’s life into something that makes you miserable with little prospect for big successes, and more than likely you may end up worse off. Organizing goes against the current both of overt oppression and coercion, and tactics that allow people to delay, defer, or avoid the nasty stuff in society. This is something that should be recognized, understood, and inspires us to put minds together to deal with it. In the film “The Wobblies,” an old IWW member retells the story of a recruit who asked “What does this membership card entitle me to?” to which the IWW delegate said “Fifteen years in the penitentiary.” The recruit signed up. That example provides good contrast to common thinking about how this all works. Today people often fixate on victories, material gains, and winning something for people. The problem is that fighting often involves losing more on a social level than any immediate gains we might achieve. Even when we have all-out wins, it’s not clear that it is actually a win for those people. This Wobbly who signed up did so not because of concrete gains they might have gotten, but in spite of the misfortune that would ensue. Put politics aside and think of all the meaningful, pleasant, and important social things someone has to sacrifice in order to do the tedious, tense, and often hostile work of organizing. Attempts to understand commitment to political projects in terms of a cost-benefit analysis will trip up here consistently. To build movement we need sustained long-term action on a consistent basis— something that is not likely to be enjoyable, filled with victories, or motivating by itself. What allows people to maintain this action is bigger. A will to struggle in spite of everything comes from deeper inspiration; ideas and ethics that carry people through misery. Union contracts and campaigns usually focus on breadand- butter issues like wages, healthcare, retirement, etc. Yet when attending union meetings where grievances are aired and you talk to workers organizing, you hear distinctly different discussions. Workers persistently raise issues of respect, dignity, and injustice as their primary motivating force. The union often channels that anger into those wage fights, but the issue is different. To carry things out, people need to be inspired to work towards a better world. In doing so, they become willing to do things that do not make sense on a strict dollars and sense basis, and even can make them happy having contributed to something bigger in life. Just do the math. I once participated in a four-month strike allegedly for a $1.50 per hour raise. At the workplace, turnover was high with most workers lasting less than a year and nearly all less than three years. The costs of being on strike immediately went beyond anything the workers would ever see. Likewise the workers were willing to occupy board members’ businesses and be arrested to help win the strike, incurring more personal harm, both financial and otherwise. When the union pressed to settle the strike it was for 25 cents per hour, and after the negotiating of the contract nearly everyone quit. A few likely were disillusioned, but for many it was an eye-opening experience. Some co-workers went on to become active in unions and more committed to working in their industry. The logic of this scenario makes no sense unless we look to the motivations of the workers that go beyond their immediate demands. In fact the demands seem to matter very little beyond the will to address injustice, work against management that is perceived to be tyrannical and wrong, and a willingness to work for something better. I call this the “collective mood” or “political will.” Rather than an appendage to our work, it should take a center role in our thinking about how things play out. Today there are countless opportunities to organize and potentially motivating issues, and yet given the circumstances people often choose not to. That is a reality we have to deal with, and that should be pointed out in our work. When you pull that element out, it becomes apparent why people are not ready at any moment to dedicate the bulk of their life to politics. Without the collective mood to fight, the best organizing will ebb and flow with the amount we are asking from people and their level of frustration with short-term issues. This is in keeping with most recent fights. Places heat up, people mobilize, and then life goes back to normal with the exception of a few individuals who become more active for years, and a smaller minority for their lives. Coming to act can change people even when they lose. Some come to see the possibility of a better life through experiences with organizing, and this can open space for revolutionaries. Our job is not just to help open that mental space, but also to offer our analysis, ideas, and values that can carry people from immediacy to the bigger picture. For those who are interested, we need to work hard to both prepare them for future fights and inspire them to carry on and go deeper. With others who don’t want to continue, our focus should be on planting seeds and understanding that there has been an increase in the social experience of struggle; things which may ripen at other times. If we can sustain individual militants and work towards networks of organizers who come out of struggle, those linkages and experiences can form a backbone of social organization that isn’t identical with our projects or groups, but that can in crucial moments bear fruit. This is part of why it is so demobilizing when people try to hide, remove, or actively prevent revolutionary politics from the day-to-day work of organizing. Without engaging people politically we are abdicating our ability to provide tools that can motivate potential militants. It also gives us clarity as to why apolitical and neutral organizing is such an idealistic approach; the very basis for action comes out of how people think about the world and their actions. All action is inherently political, and our response can contribute to or stunt its trajectory. In the present environment we have to take into account that likely only a few will want to commit themselves to sticking it out for the long haul. That doesn’t mean necessarily we change what we do, but it should change our expectations and how we respond to difficulties. When we can contribute to making organizing happen, it does have an impact on people’s lives and thinking even when they return. This situation could change. There are times when broad swaths of society catch a wind and hunker down for social change. By recognizing the role of political ideas and ethics in motivating and the force of political will within social action, we arm ourselves to understand and act on different situations that may come at us. Today this means finding ways to plant seeds, spread collective activity that can help transform people, and investing in people who rise above and become willing to commit to something bigger.